I guess I'm fortunate as the wind usually whips most of the snow away from my front door. Further down Woodlawn Avenue a neighbor of mine took things to a higher level when he built his house. Mentioned his radiant heated driveway awhile ago. While radiant heat is the rage in Iceland and spots across Europe, it's rarely used here. On Elmwood and Bird, We Never Close installed it and Paul Johnson - Johnson & Sons - at 60 Brantford installed it recently, too. Anyone want to venture a guess as to why we don't see more of this application. Like to know. Wrote about this spot yesterday - Biting My Tongue! - Really amazing inside. Just loved the attic space. 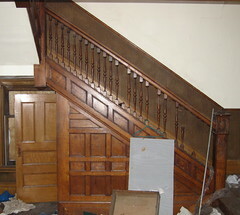 95% of the woodwork through out the house is still in place. Appeared as though electric and heating had been updated recently, too. Had a dinner meet-up with a restoration artist and film maker from the Czech Republic. She was totally amazed with the potential of 97 Dodge Street. When she saw this map and realized that this spot is steps from the subway and around the corner from Artspace...she thought for a moment that Buffalonians have forgotten something important. Her current restoration work connects her to Buffalo's heritage and she's very hopeful that someone will step-up and complete this project. She's ready to help in lending her expertise. Let me know...i'll make the connection. Wanna take a closer look, join me for a Saturday walking tour of the Artspace Backyard. Rod, myself and few others will be presenting this idea to City folks at some point next week. Meanwhile if you have any suggestions or would like to bring additional resources to the table to help move this project along, please let me know. Or reach Rod directly at the King Urban Life Center - 891-7912 or via email. 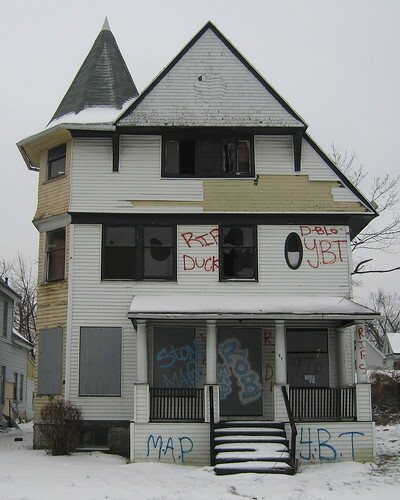 Make sure to check out Chicago based architect and frequent Buffalo Rising contributer David Steele's post from last April - Why is this house doomed. One of my favorite spots along Michigan Avenue. Here's the map! 1325 Michigan Avenue is the most unique building - besides St. Vincent's - between Artspace and Performing Arts HS. If you are interested in taking a closer look, we walk past here during the Artspace Backyard walking tour on Saturdays. Behind the roll-up garage door thing is a very cool entrance into a retail spot. Last year, Chris Hawley identified this location as a former tavern, back in the day in his Midtown: Poised for Renaissance. During the course of the past month a few influences have been converging. Vermont trip, garden and just recently this article - Unhappy Meals by Michael Pollan. 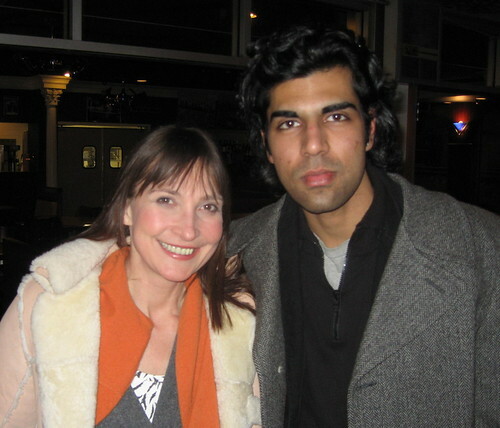 On top of this, had the opportunity to spend some time with Samina Raja last week. Saw this post card on her office bulletin board at UB's School of Architecture and Planning. Samina passed along a copy Food For Growth: A Community Food System Plan for Buffalo's West Side (2003). It's a joint Massachusetts Avenue Project and UB planning collaboration. I've archived the full 164 page report - right here (link to .pdf file). Good material here for what is most likely going to called the Queen City Farm over at 194 East Utica. It maybe when we no longer know what to do, we have come to our real work. And that when we no longer know which way to go, we have begun our real journey. First mentioned this house - 97 Dodge, last summer after I attended my first Coe Place block club meeting. Been drawn to it ever since. Not including what looks to be like a magnificent attic, this single family home has more than 2600 sq ft of living space. The City of Buffalo has owned it since November '05. 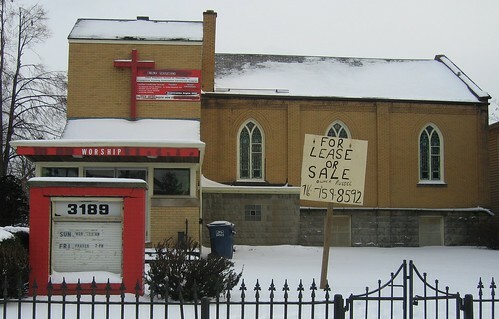 On Saturday, during the Artspace Backyard walking tour, we noticed that 97 Dodge has been marked for demolition. While I fully understand that we can't save every building here in the City, I believe that we have to be strategic with how we approach demolition. 97 Dodge is located one block from Main Street and two blocks from both Artspace and the Summer Street Station. Here's the map. The house appears to sit straight on the foundation and despite the graffiti and a few broken windows the house is in excellent condition. Another view from June 2006. Make sure to check out these two spots, too. Both City owned! At a minimum, a very small part of the 12-15K that will be spent demolishing this place could be used to mothball this house. In a few years when the market catches up to this block...presto, way cool house. Let me know what you think, especially considering its location. Had a long sit down with West-side resident and community activist Harvey Garrett last week at the Sonic Café. We toured the neighborhood around Artspace and explored some of the connections to my immediate neighborhood across from the new Performing Arts HS on Woodlawn Avenue. We both agreed that these developments have tremendous potential, in a catalytic way, to help move and revitalize this near East side neighborhood. I look forward and welcome Harvey's participation in a small project in the Artspace Backyard area involving the homesteading and re-settlement of three City owned properties. (Right now, you'll learn more about this on during Saturday Tours at 11am.) First wrote about meeting Harvey, right here. Frequent readers of fixBuffalo often get two messages from my blogging. I'm aware of this. While simultaneously promoting my neighborhood (see map) - including highlighting the dozens of opportunities that exist between Artspace and Performing Arts - I would be remiss if I didn't call attention to the various issues involving what I've come to understand as deep structural neglect. Think knowing is better than not knowing when it comes to these things. My perspective, or so I would like to think, is marked by a sort of insider-outsiderhood. I have no special training in law, public-policy or planning. I just walk around with my camera and at the end of the day do my best to share what I have seen. If my blogging appears confused, well consider that it may reflect the reality of living on street with a 30m school renovation project and dozens of abandoned, boarded, derelict and vacant houses on the block. Most of these are owned by the very entity re-building the school or people controlling these entities. It is confusing. And yes, despite the boards, i see extraordinary opportunity and beauty behind them. Task, of course is to find people who desire and are willing to do the same. Sure, I leave Buffalo six times everyday - who doesn't? - I always come back a seventh. Love where I am. Cannot imagine being anywhere else. Regular Saturday Morning Tours - right here! flickr slideshow - Performing Arts HS/January 2007. Chris Byrd shot this short video! See BAVPA Re-Construction Archive for details and construction updates. A few weeks ago, I cobbled together a number of boxes for raised garden beds. Enough lumber that I salvaged from an abandoned City owned house down the street to build another four. Idea here is to plan and plant a little neighborhood garden and give away a few plots to some interested neighbors. Yes the house over on the right, 1466 Michigan Avenue, had a new roof five years ago and is in excellent structural condition sans windows. It's part of my view from my desk looking out my office window. City has owned this house since October 2005. It's wide open, despite my boarding and re-boarding. Porch is crap...yet this house is an excellent double and sits less than a 100 yards away from the 30m renovation of the future home of Performing Arts High School. There are more than a dozen such abandoned, boarded, derelict and vacant places the same distance away from the new school. Worst offender, Rev. Stenhouse's Bethel CDC - Boarding Control. Cool video, right here. If anyone has some advice on community gardens or would like to help, let me know. Know you've been getting your fill of church closings. Here's something different. Saw this at the corner of Main and Northrup on the way to UB School of Architecture and Planning this morning. Living in a church would be a total trip. I'll call Russell in the morning and see wasup...and maybe grab some interior pics! There was a time not too long ago when colleges and universities thought of themselves as very separate from their host cities. But that's a dying notion and clear evidence of that is Campus Compact, a coalition of more than 1000 colleges and university presidents who promote civic engagement among students and faculty. To tell us about the work of Campus Compact, we have its president, Maureen Curley and Roger Mandle, president of the Rhode Island School of Design. Promoting civic engagement in a very different way is Vicki Been. Vicki's work at the Furman Center for Real Estate and Public Policy is helping New Yorkers unravel the mysteries of real estate development proposed in that city so that they can influence what happens. Listen to host Carol Colletta - list of additional stations/times - 3pm on Saturday and 7pm Sunday on WNED - 970 in Buffalo, NY. Past Shows are archived and the newsletter is published regularly. Smart City is underwritten by Buffalo, NY's own Hyde Family Foundation...thanks George! Regular 11am Saturday morning tour of the neighborhood - Backyard at Artspace. Meet-up in the Sonic Café area and plan on walking down Coe Place, around Ellicott, Northampton and Holland Place and Dodge if we have time. Plenty to see and learn about in an hour. Come on over and learn about the coolest emerging neighborhood in Buffalo! Here's the map! Here's what we saw on a recent tour - Saturday Surprise! 194 East Utica...On Life Support! Spent part of the day at UB's School of Architecture and Planning talking with Samina Raja and Rod Mccallum. A few months ago Rod caught one of my posts about 194 East Utica - Saying Goodbye? 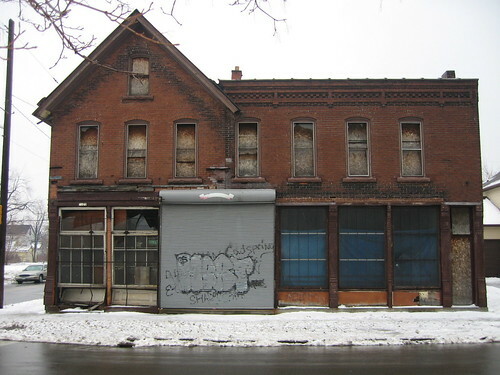 David Steele, Chicago based architect and frequent Buffalo Rising contributor wrote about 194 East Utica, last April. Deeply moving piece - Why is this House Doomed? with an amazingly haunting sound track on the slideshow. Here's the map! At Rod's request, I asked Preservation Board members recently to stay the demolition of this City owned property. These folks have been very cooperative. Just asked and got a renewal for another 60 day stay of execution. 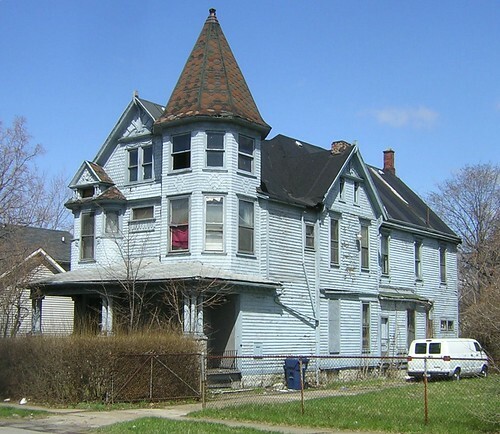 At 194 East Utica Street in Buffalo, New York stands a grand Victorian home built in 1900. The city planning board sees another vacant lot in the future of 194 but our vision is very different. We see a vibrant community space that brings the neighborhood together and energizes this vital corridor between east and west. We see a restored parlor providing space for block club meetings, parenting classes, and a homework club. 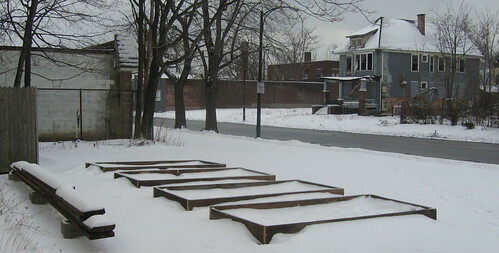 We see some of 21 vacant lots immediately surrounding 194 providing nutritious food and an essential connection with nature for neighborhood children and families. We see a renovated kitchen being used to teach single mothers how to prepare quick and healthy meals for their children. We see seniors from the nearby senior center establishing a presence in the streets while beautifying the neighborhood and getting exercise in the gardens. We see inexpensive housing for community development volunteers and families in transition. We see young men and women learning a trade with hands on participation in a major renovation project. We see a place of hope and transformational development rising from a glorious past, through a challenging present into a bright future. This vision is not only possible but with your support it is within our grasp. Thank you for your time and consideration. Tomorrow afternoon Rod and I are back at UB School of Architecture and Planning. We've been invited to address two of Samina Raja's classes. The goal here is to include UB students in various aspects of the planning and promotion of this project as a living laboratory of sorts - a working and living space. All sorts of discussion about grants and developing a sustainable model for other people to follow. What's amazing is that 194 East Utica is right in the middle of 50m of public investment - see map - in the arts and education in this part of Buffalo - Artspace, Merriweather Library and the new home of Performing Arts HS. The African American Cultural Center is just around the corner, too! See the 2007 Tour History! Been working on my writing for sometime, see my faq for more. Had an opportunity recently to meet-up with two friends, Prashant and Monika for a few beers. Both are accomplished artists, film makers and serious fashionistas. Monika is from Prague and Prashant, Bombay. He also does tantra workshops here, in europe and back home. Very cool people. Plan is to collaborate on a short piece regarding the impact consumerism has on people lives, the choices they make and how it shapes relationships, today. Three characters, two men and a woman. Should be interesting. Drawing from shared experiences, the idea is to tell the same story from multiple perspectives. Tomorrow morning at the Science Museum a community forum on Buffalo's trees. 11:30 Community Community Leaders will each speak briefly on their response to the storm and their plans for the urban forest with responses by our guests. It was like yesterday. Hard to believe this was four months ago! Still think these trees and thinking make for good choices. Essentially we are a group of parishioners who are investigating working out an arrangement with the diocese to manage and finance repairs and basic operating in the very possible event that St. Ann's loses its status as a parish. St. Ann's is also a shrine, and we are hoping we can keep it afloat in that capacity. That will mean incorporation at some point, but all with approval of the diocese, and that is a discussion that still has to take place. At this point, the main thing would be to put the call out for anyone interested to contact me. 2008 is the parish's 150th anniversary, and we are pretty certain we will be around at least that long. As we plan events for that, we can use any help anyone can offer. Here's the link to St. Ann's via Buffalo as Architectural Museum. You can reach Dr. Ederer here - EDERERMF@BuffaloState.edu if you have resources and/or would like to help in this effort. Earlier this summer Dr. Ederer joined me on a PresCo sponsored bicycle tour. We stopped by St. Ann's. Here's the post. Dr. Ederer's book - Buffalo's Catholic Churches: Ethnic Communities and Architectural Legacy (2003) should be on your coffee table. It's an excellent text, with pics, describing the rise of Buffalo's Catholic parishes. The school building, adjacent to the church, is mammoth. I see it from roof tops all over the East side. Will have additional photos, soon. Occasionally I'll post some tech or blogging stuff...so not in a Buffalo mood, right now. With this program - I've been a fan of it for years - you can have your bookmarks anywhere. Way cool ways to share, too. For example, one of my favorite fin-de-siècle writers is Arthur Schnitzler - not only was he shrink to both Freud and Jung he wrote the book that Kubrick turned into a movie. Click and see the bookmarks. Very easy to use, especially with Firefox as you can embed del.icio.us in your tool bar. Click and save, simple. When you click into my del.icio.us/fixBuffalo you'll see a bunch of tags. It's how bookmarks get organized. Again, favorite French historian, Braudel. You can also see what others are tagging, too. Or create a special tag and share with friends. A favorite time kill is trolling around what's popular. Lot of high end webizens tagging some awesome finds. Really cool. 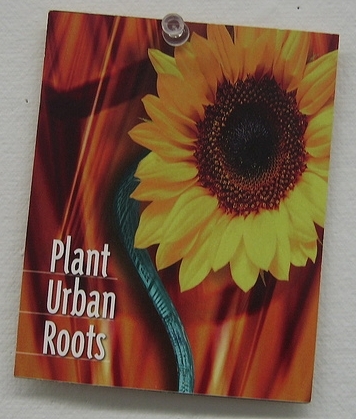 Bottom line, your bookmarks are always available - home, office, cafe or on the road. Some of them you may want to keep private. No problem. When you click on erotica...you can hide the stuff you don't want others to see. Cool. Thinkature is equally amazing. All you need is a friend, partner or colleague! It's like email and visualization combined. You can get in synch in seconds! Been using it late night with friends in Europe. Thinkature brings the richness of in-person, visual communication to the web by placing instant messaging inside a visual workspace. Use it as a collaboration environment, a meeting room, a personal web-based whiteboard, or something entirely new. If you like email, you'll love Thinkature. Sharing stuff for biz or pleasure has never been easier across any browser or network. You will not be disappointed. Really. A quick one, two this week and it's only Tuesday. Devastating news for Buffalo's East side and parts of Cheektowaga. Big wake-up call if I've ever seen one. First the announcement from Bishop Kmiec's headquarter's at 79 Oakland Place that 14 schools across the Diocese will be closing this June. I'll get around for pictures, too much snow today. Then we hear that vacancy, like a virus is spreading, seemingly out of control, from Buffalo's blighted and bombed out East side to Cheektowaga and parts of Amherst. And then there's the news from Charlotte, NC that I posted earlier tonite...rather depressing. January 22 is thought to have been the most depressing day of the year. Find out here. For me, too. Good friend diagnosed with leukemia, another told me he'd accepted a teaching position in Las Vegas and is moving next week. As a former Buffalonian, I check in frequently to your site to keep an eye on how things are going back home. As an architect, I appreciate your keeping architecture and the built environment in the forefront of your discussions. Keep up the intelligent discourse. Anyway, I moved to Charlotte in mid-2004, and thought you might be interested in another outside view of Buffalo. I looked at my Sunday Observer and was surprised to see "Buffalo Stampede" splashed across the front page. I had seen in previous days the paper was going to be publishing their study of the main sources of Charlotte's population influx, and suspected New York State might be mentioned prominently, but never did I imagine this! LEIGH DYER, LDYER@CHARLOTTEOBSERVER.COM, DATABASE EDITOR TED MELLNIK CONTRIBUTED. On the shores of Lake Erie, the city of Buffalo and other communities have withered. Two-thirds of cities and towns in upstate New York lost population this decade. Several games of the region's beloved Buffalo Bills were blacked out locally this season because of unfilled seats. The local Catholic diocese is closing schools and churches. Since its 1950s high, Buffalo's population has declined by more than half, to around 280,000. Meanwhile, since 2000, Charlotte has added 46,000 residents. This afternoon the following pix showed up in my email. Thanks Mom! Anybody know anything more about these pix. Like to credit the photographer at least. 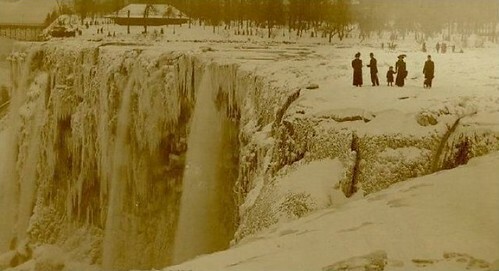 Coldest part of the winter, so far and just when I was thinking that things were going to be abit warmer for me, I'm reminded by these pix just how cold it used to be. Two duvets now on the big bed this winter...extra blanket on deck. Long meeting yesterday with local guy, whose organization has participated in funding Artspace projects in other cities. 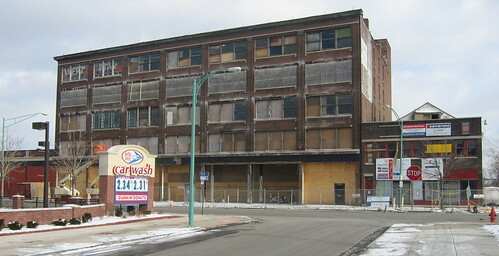 Told me that Artspace first came to Buffalo back in 2000 looking at an opportunity in the 400 block of Elmwood Avenue. He described it as a missed opportunity. Brand new information for me. Posted this back in August of 2006 - Byron TV. The dead hgtv links are in this post, too. Loved the big yellow arrow. Next Saturday - January 27th at noon - if you have some time, maybe an hour or so, I could use some help. A few houses that are owned by Bethel Community Development Corporation are still wide open and present significant public health risks here in the neighborhood. Here's the map. I'd like to meet-up at my place - 75 Woodlawn Avenue. I've collected dozens of pieces of plywood and other boarding material over the last few years and would very much like to secure the houses that Secretary/Treasurer of Buffalo's Control Board - aka, Buffalo Fiscal Stability Authority. - controls through Bethel CDC. Imagining a couple people measuring the openings, someone else cutting the boards and a few people nailing the boards in place. These places have been open for close to 18 months and there is no Housing Court file compelling Rev. Stenhouse to action. Installed a new sitemeter recently- allows me to see web traffic - replacing the older one. Allows me to see what browsers people are using to view this blog. 52% of my visitors from 48 different countries so far this year are still using Microsoft's Internet Explorer...again my blog looks terrible in IE as the right hand column drops down and fonts get all skewed in some of the posts. If you haven't switched to Firefox 2.0, you should. Really cool toolbar, extensions and tabbed browsing that can't be beat. If you are on a network at work and can't download or use Firefox 2.0 - consider Portable Firefox 2.0 for your flashdrive. I use it everyday on the go - cafe, school or on the road. You'll see more using Firefox 2.0, really. What do you have to lose...download it and see. 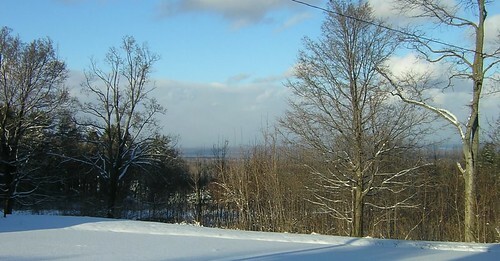 Just received the latest e-newsletter from George Grasser and Partner's for a Liveable WNY - January 2007. George is adding hyperlinks to some of his commentary and notes for further exploration of what's happening here and around the country. Check it out. I've archived past Partner's Newsletters, over here. Resilience is a quality that is greatly underrated in successful cities. Our guests this week are making their own special contributions to understanding how to make cities resilient. Sadhu Johnston is leading what may be the nation's best known municipal green program. Sadhu is the Commissioner of the City of Chicago Department of Environment where he manages a whole host of programs intended to restore and protect Chicago's natural resources. Prior to working for the City of Chicago, Sadhu served as the Executive Director of the Cleveland Green Building Coalition. Also with us is Brett Parson, winner of the Harvard Innovations in Government Award, about his success in breaking the barriers between the police and the gay community in Washington, D.C. Brett heads the DC police Gay and Lesbian Liaison Unit. Urbex @ Transfiguration - Discovery Channel Video! This afternoon I posted a request to Buffalo Issue Alerts and asked if anyone had a copy of the Discovery Channel's video of the Urbex that went on at the Transfiguration during the summer of 2005. Vince, quickly responded and sent along a file. I uploaded the material to Youtube and presto...here we go. Really amazing venture. The first three minutes are devoted to a rather high-wire exploration of Transfiguration Church. The team also visited the Anchor Bar and poked around Concrete Central...a place I've yet to see, up close. This is the same video that Preservation Board members viewed during Thursday's meeting. In case the video gets pulled for copywrite infringement, I've archived the footage in my esnips account - right here. Headed down to Perrysburg, NY on Sunday afternoon...room for one more in the car if you want to check things out. Email me. Very interesting connection back to Buffalo that I've written about extensively here - Where is Perrysburg? Was there two years ago, January 2005 for the first and last time. The view here is looking north towards Buffalo and is the furthest spot south in the hills that you see from City Hall's observation deck. Word is that Commodore Perry - back in the day, 1813 - observed the British Fleet shortly after the burning of Buffalo from this location and hence the name, Perrysburg. John Paget - see Paget Films - and I had the opportunity recently to visit Transfiguration Church. John shot four hours of video and has condensed some of the highlights in to this short two minute clip. I had the opportunity yesterday to share this video with Preservation Board members during their meeting. We also saw a longer piece that was shot by the Discovery Channel. First saw that video in 2005 and would love to get my hands on a copy. Was then that i learned for the first time that the bells were still in place. Ringing them is rather exciting...done it a few times. Seems like people are just too casual, these days. On a personal and community level we avoid passionate commitment - the energy necessary to sustain structures like this. Our quest is for certainty and we avoid activity that requires faith. 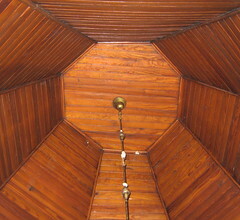 When we do this we kill beauty and things like this church become nothing more than a distant faded memory, dust. All rather tragic when you dwell on it and think about the treasures here that are now scattered...gone now, silent.